Comets that take more than 200 years to make one revolution around the sun are notoriously difficult to study. Because they spend most of their time far from our area of the solar system, many "long-period comets" will never approach the sun in a person's lifetime. In fact, those that travel inward from the Oort Cloud—a group of icy bodies beginning roughly 300 billion kilometers away from the sun—can have periods of thousands or even millions of years. Astronomers already had broader estimates of how many long-period and Jupiter family comets are in our solar system, but had no good way of measuring the sizes of long-period comets. This is because the cloud of gas and dust that surrounds each comet—known as a coma—appears hazy in images and obscures the comet's nucleus. By using WISE data that shows the infrared glow of the coma, the scientists were able to "subtract" the coma from each comet and estimate the size of the nucleus. The data came from WISE observations of 164 cometary bodies—including 95 Jupiter family comets and 56 long-period comets. How far must the known Kuiper Belt extend before it becomes the hypothesised Oort Cloud ?? Presumably there is a large gap between the Kuiper belt and the Oort cloud, with the latter starting at around 0.03 and 0.08 light years, and extending out to as far as several light years depending on predictions. Its presence was postulated by Jan Oort who saw a need to explain where long period comets came from since they would never have formed in their highly elliptical orbits around the sun, but must have formed well beyond the solar radiation which eats them away. Dingbone brings up the important aspect of larger bodies in the Kuiper Belt, which is well established and may very well harbor a planet 9, much larger than Pluto. 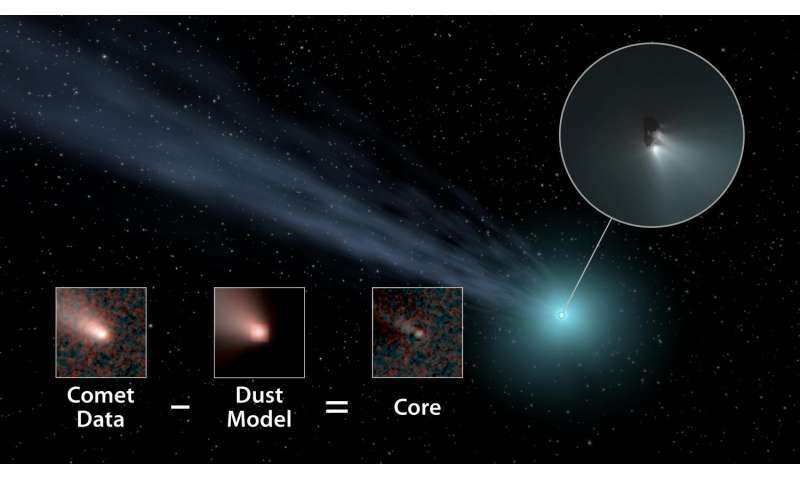 This could easily explain the origin of long period comets, with these large bodies perturbing icy chunks to rain down into the inner solar system. As a large chunk approaches the Sun, its velocity would increase dramatically and then if it survives without impacting, could get thrown out a great distance, resulting in long period comets. Sling-shotting. Why double lobe / elongated geometry of comet nucleus [and asteroids] is so common and how nebular hypothesis could explain it?